Like most progressive bands with roots in the late 60s and early 70s, Mandrill found themselves becoming increasingly commercial as the 70s wore on. 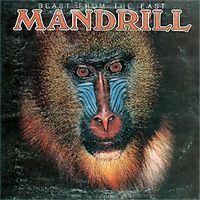 Beast from the East is a fairly commercial album with a disco undertone, but to Mandrill's credit this album shows that they hadn't lost much in important areas such as instrumental and vocal skills, creativity, artistic integrity and the ability to put out great interesting music within a more confining commercial space. Groove music from this era was expected to have that steady disco kick drum thud on every downbeat, but Mandrill does a great job of turning to African highlife, Latin rock, Calypso, blaxploitation soundtracks and good old American hard funk to dress up this repetitious beat and keep it interesting. At the very end of the album Mandrill gives us a taste of their more progressive past with two excellent instrumentals. Aqua Magic opens with cascading piano arpeggios from keyboard virtuoso Claude Cave, then the woodwinds break into an ancient melody before the band kicks into a hard Latin groove that rivals early Santana. A semi-classical keyboard section interrupts their rampage before the band is off again, this time topped by a jazzy dissonant flute solo. These guys can play! The album closes with a mournful space/lounge jazz tune with a cool 'futuristic' exotic synthesizer melody. Although this album shows Mandrill heading further from their progressive roots, it is nice to hear that they were able to get with the thump-thump-thump 70s in a way that was creative, intelligent and not damaging to their artistic integrity. If you like IDM from the 70s, then you might dig this somewhat commercial, but very high quality effort from Mandrill.